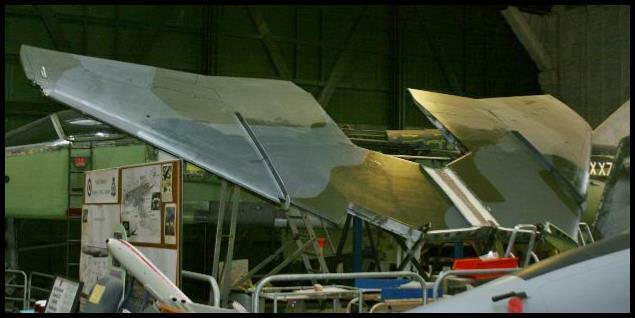 Having completed the rebuild and painting of the trailing edge, the wing was rotated to the horizontal position. 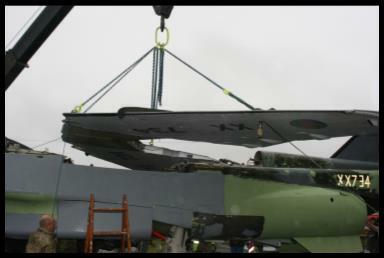 It was then rotated into the nose down position for repairs to the leading edge and to complete the painting. The completed wing back in the vertical position for stenciling. 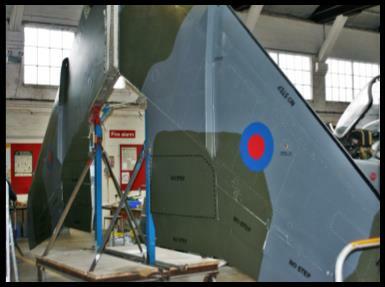 The wing repairs would have been far more difficult if we had not had the specially designed and manufactured wing stand. The completed wing was lifted on to the fuselage by 6th Armoured Close Support Battalion from Tidworth using one of their heavy recovery vehicles. 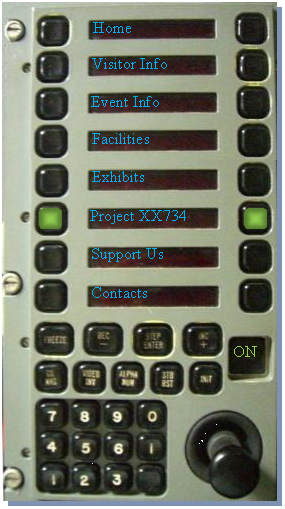 They also carried out a couple of other lifts for BDAC that day. 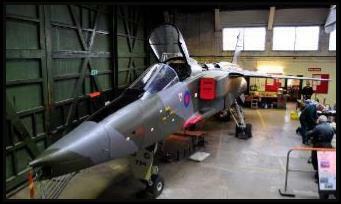 The primed fuselage complete with finished tail fin was rolled outside (for the first time in 2 years) on the 19th November 2015 to have the wing fitted. 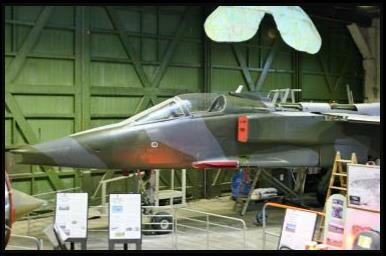 For the first time since leaving Gatwick Aviation Museum in May 2013 XX734 is largely in one piece. 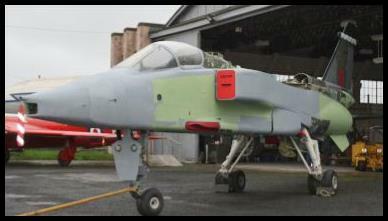 The fuselage has now been painted in the original three colour camouflage paint scheme (light/dark grey and dark green), and the stencils have been applied . 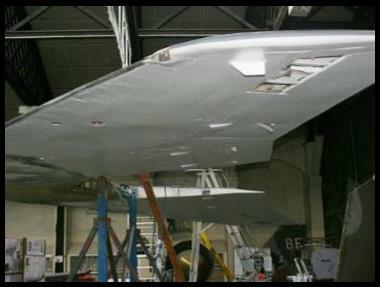 A dummy seat and coming have been made and fitted, together with 3 wing pylons. Not quite finished with a couple of spine covers and a wing inboard leading edge to complete. There are no doubt perfectionist and purists who will say that’s not right or that could have been done better, but given where we started and where we have ended up, we have saved a near wreck for others enjoyment. It has been a long trip with some dark moments but thanks to an excellent team of skilled volunteers and help from friends, strangers, businesses, other Jaguar Groups, and Museums we have made a big difference to her, and she has now taken her place on display in the collection.